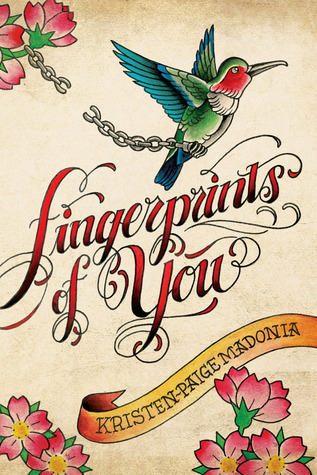 Admittedly, I was drawn to the book because of the gorgeous tattoo cover art, but was pleased to discover that Kristen-Paige Madonia’s debut, Fingerprints of You, was an excellent example of the rare category of YA literary fiction. Lemon is the only daughter of Stella, a woman who never grew up. Lemon and her artistic mother have bounced around small towns for most of her childhood, leaving when Stella’s relationship with her current boyfriend falls apart. To commemorate Lemon’s 17th birthday, Stella decides to get a tattoo of a navy hummingbird to symbolize Lemon’s “flight from childhood,” but Lemon knows it’s really because she has the hots for the tattoo artist, Johnny Drinko, never mind the fact that he’s ten years younger. But it isn’t Stella that hooks up with Johnny Drinko. Lemon does, mostly to spite her mother. This time around they pack up and leave town because of Lemon’s indiscretion. When they arrive in their new home, Lemon discovers that she’s pregnant. Lemon knows she’s better off without Johnny Drinko to help her raise her baby, and is resigned to becoming a single parent just like her mom. But being pregnant does raise questions for Lemon about her own father. All she knows about him is that her mother left him in San Francisco when she was pregnant with Lemon, and that he never went looking for her. In an effort to find out who she is as much as who her father is, Lemon embarks on a cross-country road trip on a Greyhound bus to California in search of her father. Against the backdrop of San Francisco landmarks like Haight Street and the ruins of The Palace of Fine Arts, Lemon learns important lessons about forgiveness and love. This novel is understated and unfussy. A true coming-of-age story, Lemon is a different person at the end of the book than she was at the beginning. There are not many dramatic, intense moments, but a series of experiences that seem true and believable, full of characters that are compelling and relatable. Kristen-Paige Madonia captures the voice of a generation, and I look forward to more from her. This isn’t my favorite literary YA novel this year, but it had some stiff competition with Mary O’Connell’s The Sharp Time and emily m. danforth’s The Miseducation of Cameron Post. Still, it was a good book I’d recommend to mature teens and adults who enjoy bildungsromans with female protagonists.